Power Manager 3.5 is now available. This is a free upgrade for all registered users of Power Manager 3. Power Manager 3.5 is a feature packed update from v3.2. We put significant effort into getting your first schedule up and running as quickly and easily as possible; a Schedule Assistant helps you get started and doubles as a way of communicating just what Power Manager can do for you. Setting up a serious energy saving schedule has never been so easy. Under the hood, Power Manager v3.5 introduces a new scheduling engine, an improved interface, and a new meta-package installer. The new scheduling engine is built upon an open architecture; this architecture lays the foundation for the next few years of Power Manager improvements. The new architecture's open nature provides scripting at all three layers of Mac OS X: Automator, AppleScript, and UNIX command line. Through this blog I hope to show off some of the capabilities scripting brings to our users. The same architecture also improves security. We now delegate all the authentication and authorization to Apple's Mac OS X services. This makes it easier for administrators to manage Power Manager centrally. A selection of little touches also make their welcome debut in Power Manager 3.5. We have added undo support in the System Preference. Daily events now support any combination of days. And notifications no longer take keyboard focus. 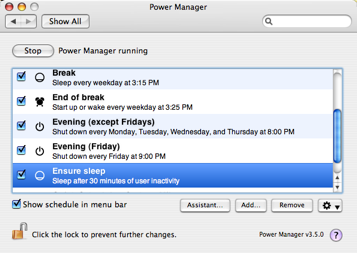 You can try Power Manager free for 30 days. A single Mac licence costs 20 €, with licences as low as 3 € per Mac for orders over 100+ Macs.